This is an orchid no one should be without. It is a strong growing little plant that produces long lasting pink flowers at the ends of short canes each spring and over time it becomes a large tangle of roots and stems like the plant held by the Temperate team in the photo. The species is native to Central America where it grows from 1200-1500m in coolish evergreen or semi evergreen forest. 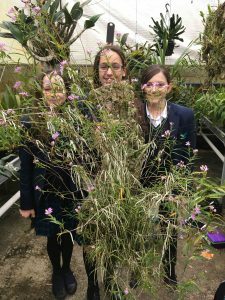 We have been growing the species for 25 years at school and find that it is not fussy about temperature – it grows well in Cool Asia, Cool Americas, Warm Americas and Warm Asia but it does enjoy air to its roots (mounted or in very open bark compost) and plenty of water. It has the advantage of propagating really easily – either by seed (and we have had seedlings flower just 1 year out of flask) or by division as it produces lots of small plants on its older stems as it grows. We have several plants to take to Paris with us, both for display and for sale. We have done more label changing with this plant that most. 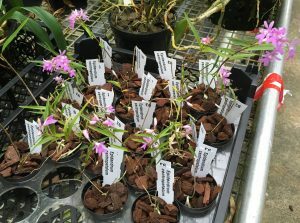 In 1993 our plant arrived as Epidendrum centropetala but it changed to Oerstedella centropetala soon afterwards as Epidendrum was split. 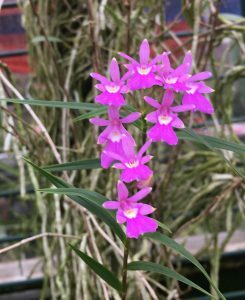 A further change to Oerstedella centradenia followed, but from recent molecular studies it has returned to Epidendrum, and is once again Epidendrum centropetala. The plants don’t seem to mind what we call them.